Ok, I can’t wait any longer. I think it’s about time to blog about the reason I haven’t been blogging much lately, instead of once again sitting here staring at a blank page thinking of anything to say except what I want to say which is, I’m 3 months pregnant with baby number 2! We’re so excited to have the final piece of the Lang family puzzle in motion. I’m due in June and am especially excited to be having a Spring baby. Having a baby at the coldest, darkest time of the year was really tough. So that’s our happy news and I’m so relieved to have the first trimester behind me. I can tell already number two is going to be filled with a lot more worry than the first time around. And the sick, jeebus. I don’t remember it being like this with Oscar. I’ve been knocked out for 6 weeks now. I was really hoping it’d miraculously disappear right in time for Christmas projects but it’s digging its heels in. I’m crossing my fingers and wishing on every 11:11 that this is my last week of it and that mythical 2nd trimester energy will kick in just in time to make some gifts and cookies and Christmas merriment. Any minute now I’ll be able to somehow propel myself out of the sinkhole I’ve created in the couch straight into a Christmas frenzy. I am feeling motivated to find a nice gender neutral knitting project for the baby (knitting I can do from my sinkhole) and to think really happy positive thoughts. And happy thoughts and congratulations for fellow pregnancy friend Kim! Congrats on the new addition, and here’s hoping to a nausea-less 2nd trimester! i can’t believe how much you get done! Oh! Congratulations!! A new baby! Congratulations! A new baby is exciting! I hope you have less nausea when you enter your second trimister! oh my gosh! yay yay yay hillary! is it wrong that i am already wishing girl girl girl??? Congratulations!! How very exciting. Wishing you the best! Oh, I just KNEW it!!! Hooray! Super big congratulations!! I’m pregnant with my first, thankfully it’s almost over for me (due 1/24), but I think those first 3 months of sickness were absolutely the worst of my life, so they are still pretty fresh in my mind. I hope the rest of your pregnancy goes swimmingly! Happy, Happy, Happy News! Wonderfully happy congratulations to you. Nothing better than a spring baby (except a winter, or summer, or fall baby), and all healthy babies are cause for celebration any time of year! congratulations! hope everything goes smoothly! Congratulations! A one-of-a-kind Wee Wonderful, indeed! Congratulations on baby version 2.0! Hope the sinkhole fills up soon (under you, not over you, of course ;)). wow! that is a great Christmas project to be working on! I got sick with all three of my kids but once the first trimester ended I felt so much better. Congrats to you and your family! Happy news is so wonderful to hear! Congratulations 🙂 Hope you feel better soon! Congrats!!! I’m so excited for you. I hope you get past the ickies soon…I’m sad to say that my morning sickness (more like all day sickness) got worse with each of my 4 kids. But it didn’t last as long :o) I was sick of being sick. I feel for you! I can’t wait to see the sweater you are going to knit!!! congratulations on your 2nd baby. HURRAY! Hearty congrats on the pea in the pod! I had horrible sickies the 1st few months with my daughter and a couple of things helped: ginger chews and/or ginger tea. sea bands – I don’t know *how* they helped, but they did seem to offer some relief. and my doc gave me a prescription in the last month of sickies for an anti-nausea dissolve-under-your-tongue tablet that worked wonders when things got really rough. If you need more knitting ideas, there are some neat ones at bloggybabybumpers.blogspot.com. huzzah! congratulations. december birth dates sure are tough — my little one’s is right around Christmas. wishing you many happy, healthy days ahead. Congratulations! Having two kids is really cool. Harder, but cool. I can appreciate more of my first child’s personality and funny quirks now that I have a second child to compare her to. They are both completely different and completely wonderful. Also have fun sharing your pregnancy with Kim. My best friend and I were pregnant at the same time and it really was the best. Then something aligned cosmically and our babies were born on the same day! Nothing can be cooler. Congratulations and good luck. Congratulations! June is such a pretty time of year for a new baby!! I hope you feel energetic and well! I finally had to bribe my second child to stop giving me heartburn and nausea at the same time. I mentally swore that I wouldn’t ground him the first time he deserved it if he would quit making me sick. Either it was a lucky coincidence that it worked or I owe him big when he’s a teen. Ohmygosh ohmygosh ohmygosh … congratulations! I’m so happy for you … babies are awesome. (The 4 month old on my lap agrees). You have all my best wishes for a quick end to first trimester yuckiness. Spring babies are pretty great- you get to see their naked little feet much more than a winter one! Baked potatoes helped me with my sickness and no desire to eat…there, my 2cents! Congratulations Hillary. My son was born in June(he’s the oldest of the two) and my daughter in December. They are about 3 years 6 months apart in age. A good time. Oh, wonderful! Good news like this is welcome in the face of this past week. Congratulations, Hilary! I hope the new Wee one is showered with Wee love. Great news – congratulations! And as for not blogging much, I thought it was because you were so busy creating wonderful projects to share – I am amazed that you were doing all that whilst going through first trimester ickies and tiredness – you never cease to amaze! how exciting for you and your family!! I’m a little behind you, due July 9/07. Luckily, I’ don’t get morning sickness, but I did get a lovely case of Bronchitis which turned into pneumonia and left me incontinent which in turn gave me a UTI! Whee! Being pregnant is so fun! Wonderful News! I hope you feel better soon. Take Care! What wonderful and exciting news! Now THAT’s something to blog about! Congratulations to you and Tim. That is some great news! And we needed that about now. Oh, congratulations! I’m starting to feel the itch for a second child myself. Best of luck. What super fantasic news! Congratulations to you and your family! Nothing wrong with keeping the couch from flying into space–I do it and I don’t have an excuse 🙂 Rest and be well! Oh the best news ever. So happy for you and Boxcar and Tim! congrats hilary… very exciting for you! Fantastic!! Congratulations and best wishes! Oh yay! Babies is happy news indeed! Congrats! Congrats! My second pregnancy was much like you are describing and I had a sweet girl! I decided it was all the female hormones raging around that made me feel so yuck. But dang, if the baby isn’t the cutset thing ever! I’m so happy for you! Congratulations on the up and coming number 2. All my kids are about 3 yrs. 10 months apart and it has been a very nice age spread (didn’t plan it that way, just worked out that way). Your little guy will be very helpful and old enough to play by himself when needed. It was fun. Congratulations! This is so wonderful, Hillary. Now I just need to pick out a bootie pattern. Wow! Great news! I don’t use to let a message here very frequently but I use to come here to admire your huge talent and sweetness. So today I had to let you the best wishes for the pregnancy and the baby inside. I hope to be pregnant soon then I can imagine how is to feel this “piece of Lang family” inside. Hapinness and love for all of you! Magical news…Congratulations! I hope you are feeling better soon. That is absolutely wonderful news Hillary. I hope the sickness subsides real soon. Take care! Hillary!!!!!! You know, every crafty blogger out here is going to want to shower you with goodness! Immediately I began thinking, “What can I make for the baby?” I’m so happy for you! You’ve spaced them apart beautifully. All of my children are spaced 3yr 2mo apart (by accident, not design). They are far enough apart to be in really different stages and get along in a nicer way than siblings who are closer. Oh lordy, I can’t even tell you how happy your news makes me today! Big, big congratulations to the Lang family! Congratulations! Oscar’s going to be a great big brother! I think that a baby is the best kind of Christmas (or any other season) project to be working on! Congrats! Congratulations! How exciting! Hope you feel better soon so you can enjoy the season! Congratulations! That is wonderful news. I sure do you get over the 1st trimester tireds very soon. I know that part is hard (except for the end of the 3rd trimester tireds..). Just try to get all the rest you can and take care of yourself! thanks for sharing your wonderful news! makes me all warm and tingly. hope your energy returns…not that there’s anything wrong with the couch. Weeee! Congratulations! Hilary Lang is due to have a baby in the same month as me ~ way too cool. And it’s so funny because my husband and I have been planning to name a girl Hillary for the last few years – but we keep getting boys…. maybe this time? Great news, so glad you’ve finally shared with us, it must feel GREAT! Congrats Hillary! When I saw that picture of your new knitting project on Flickr this morning, I knew. Mother’s intuition. Such happy news!!! Congratulations! All the best and I hope you start feeling better really soon. With my daughter I had nausea (not so when I had the boys) and ginger tea and peppermint tea were very helpful! So exciting – a new wee wonderful to join your family! Congratulations – I hope that the pregnancy is a healthy and happy one! CONGRATULATIONS…can’t wait to hear more news about the newest little wee wonderful! Oh my gosh, I’m there with you right now with the first trimester. IT IS HORRIBLE and I’m trying not to let it ruin the holidays but I can barely get out of bed. Congratulations Hillary! Praying for a safe + healthy pregnancy! The 2nd trimester energy didn’t kick in until 17 weeks for my 2nd pregnancy. Hang in there! Congratulations! Yes, I can attest to June being a lovely time of year for a new baby. I hope that sickness goes away soon, and is replaced by the 2nd-tri energy! congrats to the whole Lang Clan! and I do hope you are really going to feel better soon and have you told Oscar? and how can you top the name Yoda? OOOOOhhh YAY YAY YAY! Congratulations! Wowee wow wow!!! Man I had to scroll down through a LOT of comments to get to the bottom… what a fan club! Congrats from me, too!!!! Yay! Just another blogger wishing you happy baby congratulations! Wishing you all good things as your pregnancy moves forward. I saw that picture on flickr and guessed you were knitting for your niece. Duh! Congratulations! I hope you have a girl, so we can see all the fun girly stuff you come up with for her! Since I have four boys, I have to live vicarioulsy through other people’s girl-style crafts! Oh what lovely news ! Well, congratulations! What wonderful and exciting news! May the rest of your pregnancy be easy and not filled with sickness. Wow how exciteing! May little cute rays of light keep shinin upon you and get u thru the gross pukey part! oh how wonderful! congratulations Hillary! Congratulations! I too have created a sinkhole in the sofa, I’m a couple of weeks behind you with my first pregnancy. Thankfully I’ve managed to keep what little nausea I’ve had at bay with lashing of ginger ale and ginger biscuits, but I’ve still to find something to combat the lethargy and brain dead feeling. Looking forward to being inspired by all the wonderful things you’ll no doubt create for the little one when you get your energy back. It’s funny that your son’s birthday is in early December and now your due in June because my second daughter turned 3 on Dec. 6 and I”m due with my third baby June 29. Congrats! Congrats! how wonderful!! I wish you and your family all the best. Hope u start feeling better soon. I had a horrible experience all through my pregnancy with my Daughter and I thought I will never do this again. But the moment she came out and I saw her beautiful brown eyes, I couldn’t remember what I was complaining about. It’s been 3 years and now my husband and I are trying for another. Woo hoo! Congratulations! I had a feeling this was why we hadn’t heard from you much lately. I’ll bet it’s a girl! Take care. fabulous news! Congratulations to all of you! Rest up! congrats! i always had more sickness with my 2 girls than with my boy,,, so perhaps that is a sign! what great news. congrats and best wishes. congratulations!! hope the sickness comes to an end soon… so happy for you & the family! Congratulations!!! I’m thinking girl. . . . Wonderful, wonderful, wonderful news!! Oh it’s such lovely news Hillary, I’m so happy for you and Tim and Oscar! Huge, huge congratulations. Congratulations. And I’m convinced sick means GIRL! Congratulations!! I hope you feel better soon. Yippee! Oscar will be such a hip big brother. Here’s to hoping your sickies are on the way out. I KNEW it the second I saw your subject heading. My boy is a June baby, and I wish June babies on every one in the world, because it was a wonderful time of the year…sitting on the patio b’feeding. Aaah. Pleasant memories. Congratulations from another faithful lurker! Take care of yourself, and the holidays will take care of themselves. And many happy PG thoughts for a healthy and worry-free next 6m! Congratulations. Hope you get an energy burst soon. Look after yourself. Yay!!! You’ll love a spring baby! I had one in every season. Congratulations! i knew it i knew it!!!! i feel such things from on my nose… congratulations, for you, for tim and for oscar, the ‘big’ brother, does he knows? Congratulations Hillary! Hope you get some of that 2nd trimester goodness very soon. Congratulations! I hope you feel better in time to pig out on the xmas big lunch! Wow, wow, wow. I had one baby in Spring and one in Winter — Spring is way easier. The beginnings of my second baby were spent lying on the couch, Dora or something in the background and the mantra, “Do not get sick, do not get sick.” I hope that time ends for you very soon. congratulations!!! and i hope the second trimester energy gets there real soon! And now I’m even more impressed by everything you accomplish! Congrats on #2! My second was a June baby as well – June 11th! – he never wore clothes for the first 3 months of his life – the dreaded St. Louis humid summer heat! – onesies all around! Congratulations to you and your family!! I hope you feel better soon. BTW – I was sickest while pregnant with my two girls vs. my son . . . I will come out of lurking to say congratulations! I’m due in May, been feeling terrible, and amazed by all the great projects you have turned out during your first trimester. Congratulations! How exciting! We just had our second 11 weeks ago. It is much easier with the second. Hope your pregnancy goes smoothly and your nausea ends soon. Congrats on the baby! Hope you are feeling better soon. I just wanted to pop on and tell you that I linked to you this weekend. I used the pattern for the elfettes to make a dishtowel. It was my firt embroidery work ever and I posted it for my Sat. Photo Hunt. let me be in line to congratulate you!!!! wow maybe you’ll make baby bot stuff. Wow! A spring baby–it will be sunny and wonderful. You’ll be better soon. congratulations! what a blessing, indeed. oh congratulations!!!! After reading your blog nearly everyday, I feel oddly connected with you…so I am thrilled for your family. what a great xmas present for everyone. Congratulations! I hope you’re feeling better soon. Take care. CONGRATULATIONS! and welcome to the two kid world! Hooray! What wonderful news! It’s wonderful, having a baby in June: you escape pregnancy in the hottest months, and get to enjoy your new little love in lots of sunshine. I’m so happy for you. (And the second baby’s great, too, because you’re so much more laid-back and comfortable as parents.) Wishing all the best for you and your family. This is wonderful news and I am super happy for you all. What a true blessing this new child shall be–makes me cry for the sheer joy of celebrating new life. Happy, happy thoughts!!! Good things, beautifull wishes and a big hug from someone that doesn’t know you – except for reading your fantastic blog – but whose heart got filled with happiness for you and your family! Huge congratulations Hillary! I hope the rest of the pregnancy goes well and that you start to feel better now that the cooler weather is arriving. Congratulations! I started to read your blog very shortly after I found out I was pregnant with our first – an unexpected turn of events for me. During those first months when I was feeling extrememly ambivalent about having a baby your blog kept me encouraged – that it was possible to be a mom of small children and to still have a thriving creative life. Nevin is four weeks old now and not only do I love him, I also like him quite a bit. 🙂 I loved seeing the pic of your little boy at three – a little window into what I have to look forward to. Keep on writing! Congratulations! That is so wonderful. 🙂 I was much more nauseous with my girls than with my boy. And I was 37 when I gave birth this time and things went great, so let go of the “over 35” worries! It probably slowed me down a little more than when I was 28 with my first one, but it was still good. June is a great time to have a baby. So take a swig of that gingerale and think happy thoughts! Another lurker who had to say Congratulations! And just to let you know that I had morning sickness for both of our older two sons (I lost weight my first trimester with both) and didn’t feel sick at all with our third son (so I figured he must be a girl). Wrong! You never know who’s in there! Wonderful news! Congratulations to you and Tim. I’m a little late commenting, but congratulations! What happy news! I do hope the morning sickness passes – all the best to you and yours in this exciting time! I knew there was a reason why I hadn’t send out my package to you! wondeful news! congratulations! looking forward to your baby-related creations! And to think that I never even blinked, or noticed that you were down and out. You continued (right through your sickness) right on producing the most wonderful creations, stuffed, christmas like and birthdayish… As I continued to sit here in amazement at all you do!! yay! that’s wonderful AND wee news! the very best wishes to you. What beautiful news! Congratulations to you and your boys! Congrats! I hope you feel well and enjoy it all!! A new little Wee 🙂 Such happy news! Babies are always a sweet addition. Big congratulations to you! One day, very very soon, you’ll wake up with a craving for something weird and wonderful and the sickness will be miraculously gone. Take it easy and look after you and that little bump. Congratulations! I have enjoyed your blog for a long time now, but have never commented. I, too, am three months pregnant and due in June, so it will be even more fun to follow along during this time! Hopefully, we’ll both be over the icky part soon! I know this might sound wierd but, since we bloggers are a little on the odd side anyways, I guess I’ll share this with you. I think I might have had a dream or something that you were pregnant. I was reading your blog recently and suddenly thought, “How cool. Oscar’s going to be a big brother” but then I couldn’t really remember ever reading about it anywhere and, after backtracking through your posts, realized that you never had posted anything of the sort. So, I guess I felt a little pang of deja vu when I read this post now. p.s. Hope you start feeling better soon. 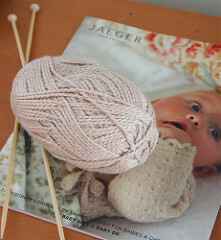 I’m curious to see what you’ll knit and if it will be from that Jaeger book. Such great stuff in there! Many many congratulations! I wish you a happy, healthy and crafty pregnancy! oh, my goodness! congratulations! Sorry about the sick, but I’m jealous. I loved being pregnant. No worries about the over 35, you just get more attention. Maybe more sonograms, and that’s not a bad thing. Do kick back and enjoy it. big, big, really big, congratulations. oh, I’m so far behind. how did i miss this??!! a big congratulations. i hope you’re getting the second trimester high by now. i’m enjoying mine–due in april…xo.